Cayde-6 is the big focus of the Destiny 2 Forsaken expansion, mainly because he gets killed in the opening few moments of the new DLC chapter. In this Destiny 2 Ace of Spades guide, we'll be walking you through how to get Cayde's weapon in Destiny 2, so you can complete the quest line for the Exotic hand cannon as quickly as possible. If you instead need help with any wider elements of the latest Destiny 2 expansion, you’ll want to head over to our complete Destiny 2 Forsaken guide. It’s on this page that you can find all the information you need about experiencing all the new DLC has to offer, including the new Gambit hybrid mode, as well as tracking down elusive Exotic weapons, like the new Lord of Wolves shotgun. At the very beginning of Destiny 2, Cayde-6 is murdered by Uldren Sov, brother of the former Awoken Queen. 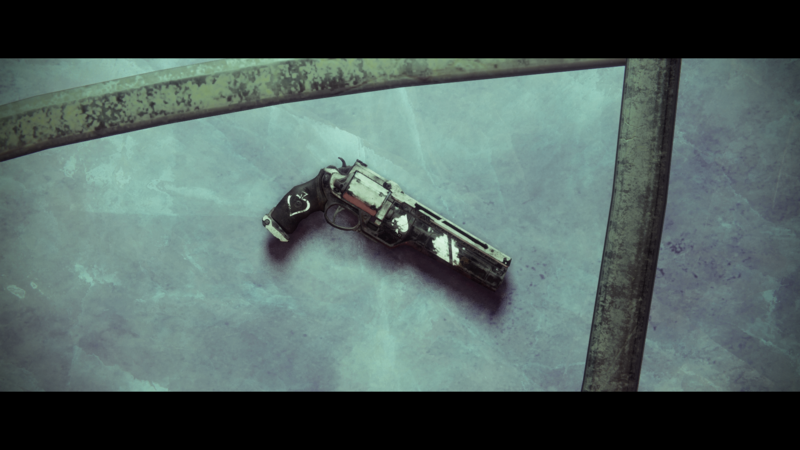 Once this cutscene has occurred in which Cayde is killed, you’ll be given the Ace of Spades item in your inventory, which sets you forth on the journey to reclaiming Cayde-6’s weapon for yourself. The first step in this process is beating the campaign of Destiny 2: Forsaken, which is a fairly tough road. Once the final boss of the campaign is down (don’t worry, no spoilers here), the quest item in your inventory will update. It now instructs you to take the Ace of Spades item to Banshee-44 in The Traveler, so make this your next stop. Kill 5 players in Gambit who are invading your team. Kill 250 enemies with a hand cannon while playing Strikes. Get 25 precision kills in the Crucible while using a hand cannon. Keep in mind that all of the steps listed above can be completed with any hand cannon, so you don’t need to stick with one weapon throughout the challenges. After this there’s even more steps, as you’ll then need to find every single Cayde Cache scattered throughout the world of Destiny 2. For a complete walkthrough of the location of all four Stashes, head over to our Destiny 2 Cayde's Secret Stashes guide. Once you’ve collected all the Cayde Caches in Destiny 2, you’ll then be instructed to complete the Ace in the Hole mission on Titan. 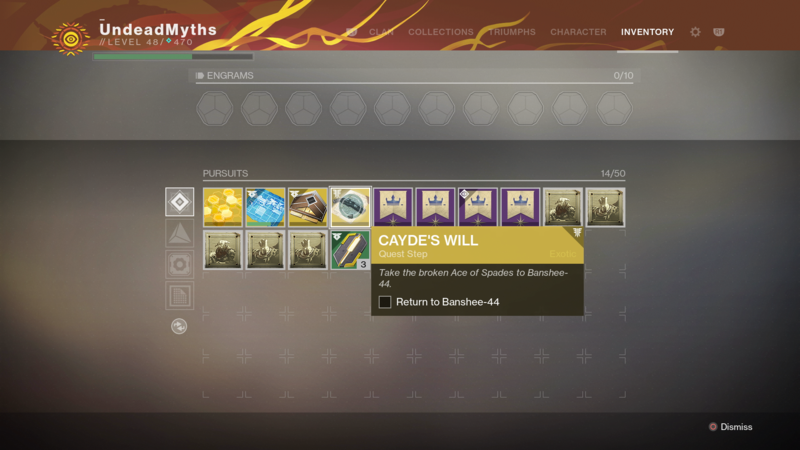 Now, at long last, you can return to Banshee-44 and be granted with the Ace of Spades, Cayde-6’s elite Exotic hand cannon. Have fun! 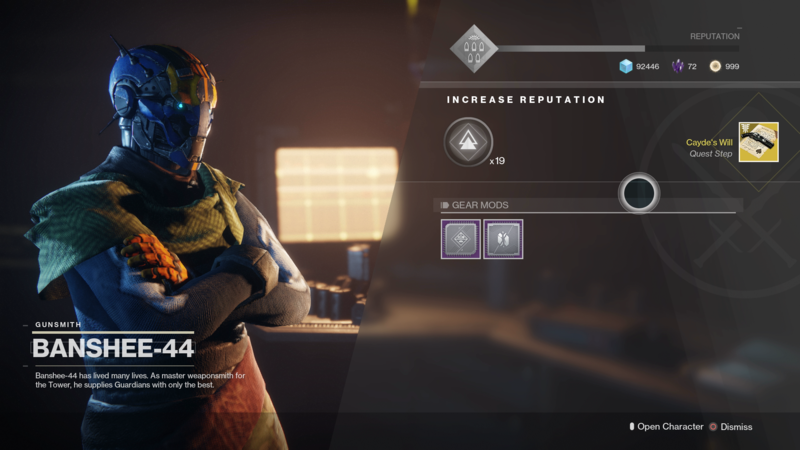 We’re all wrapped up with this guide on how to acquire the Ace of Spades in Destiny 2’s Forsaken DLC, but we’ve got plenty more coverage of the expansion here at USgamer. Head over to our Destiny 2 Forsaken weapons guide for a list of some other Exotic weapons in the DLC, or our Destiny 2 Gambit guide, for a walkthrough of how to dominate in the brand new mode.